Easy to find and near some bars. Plenty and parking near the rooms. the electric outlet in bathroom was extremely difficult to plug in items. It's a new hotel, whats up with that? On the lookout for a warm welcome and a comfy bed in Utica? Expedia's network offers around 10 accommodations within a 0.1-kilometre (0.06-mile) distance of the town center. Hotels within easy walking distance of the center of Utica, are the Holiday Inn Express Hotel & Suites Detroit - Utica and Courtyard by Marriott Detroit Utica. 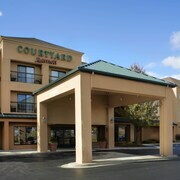 3 kilometres (2 miles) away from the center of Utica is the La Quinta Inn & Suites Detroit-Utica. This is a a great option for visitors who are looking for economical options. 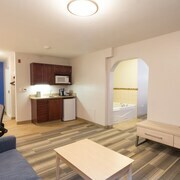 If you'd like another budget option, you could check out the amenities and rates at the Comfort Inn Utica. 19 kilometres (12 miles) away from the heart of Utica, is the The Townsend Hotel. The Royal Park Hotel is located 9 kilometres (5 miles) away. If you'd prefer, you could make a reservation at the Cobblestone Manor or the The Rochester Carriage House B&B. Once you have spent time in Utica, ensure you allow time visit Detroit - Southeast Michigan's other scenic and cultural delights. Photograph Detroit - Southeast Michigan's forests and lakes. You should also go to some of the area's history museums. Common things to do in this particular part of United States of America include snowboarding. Novi - Livonia is 40 kilometres (26 miles) to the southwest of Utica and is home to the Northville Downs and Twelve Oaks Mall. 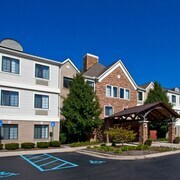 Novi - Livonia hotel options are the The Inn at St. John's and Marriott Detroit Livonia. 14 kilometres (9 miles) to the west of Utica, you can also stay at Troy - Auburn Hills, which is home to the Hilton Auburn Hills Suites and Crowne Plaza Auburn Hills. Should you choose to stay in Troy - Auburn Hills, don't miss the Bloomfield Galleries and Callahan's Music Hall. Just because you're traveling, doesn't mean you can't indulge in your love of sporting events. Comerica Park is situated 35 kilometres (21 miles) to the south of Utica. Those sports fans wishing to find a room or apartment near to the sporting action can make a choice from the MGM Grand Detroit or the Detroit Marriott at the Renaissance Center. Windsor Airport is 40 kilometres (26 miles) away from Utica. Visitors who choose to stay close by, can easily secure a room at the Lexington Inn & Suites - Windsor ON Canada or Ramada Limited Windsor.